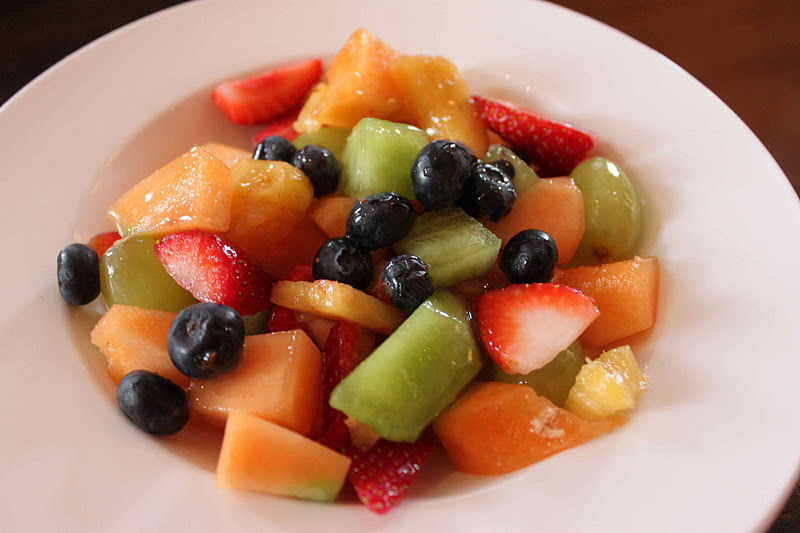 We love us a good brunch. I'm usually sick of mini-wheats by the time the weekend rolls around, that I end up treating myself to a gourmet breakfast - that someone else has made. Have you ever tried making Eggs Benedict at home? I have a hangover just thinking about it. So we leave these things to the experts at The Gladstone Hotel Cafe on Queen West, just at the edge of Parkdale. 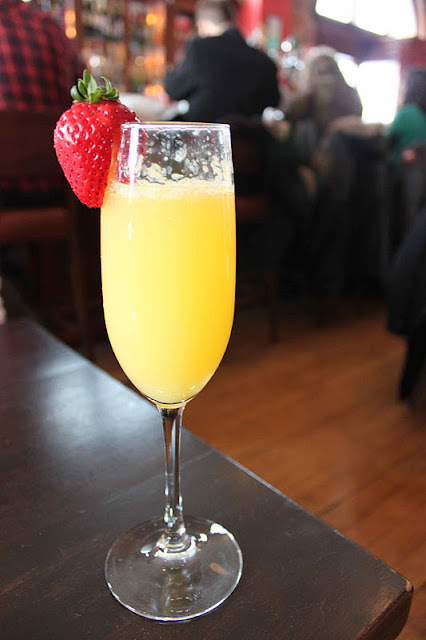 Brunch is served from 8am to 4pm on both Saturdays and Sundays on a first come, first served basis. We prefer the cafe side as things are a little bit quieter. If you are brunching with kids, the Melody Bar often has a live jamboree band and family brunch. Kids are welcome and an easy place to hang with your niece or nephew. The menu is still the same on both sides. The Cafe also offers free high-speed WiFi and is a lovely place to work during the week as the room gets a lot of sunlight. The Fruit Salad is always a nice healthy way to start ($6.95) and forces me to eat something healthy before all the fried goodness arrives. 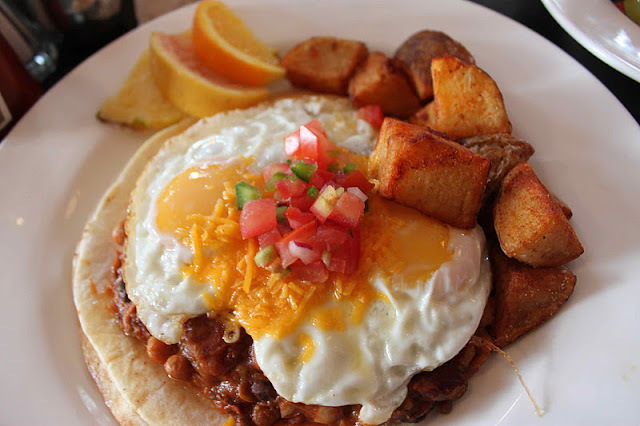 My pick is always the Huevos Rancheros ($11.95) made two eggs over easy on a cheddar and goat cheese quesadilla with veggie chili and tomato salsa fresca. It's not as spicy as I would like, but that can be fixed with a bit of hot sauce. I also like the fact that the chili is vegetarian, so you don't leave feeling like how you started the day - heavy and sleepy. The roasted potatoes are plump and crispy with a nice light seasoning. 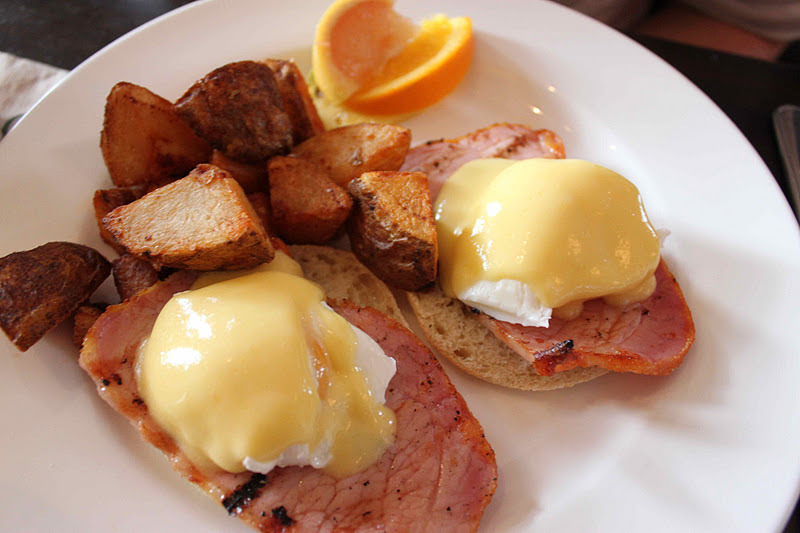 The Eggs Benedict ($12.95) is usually my second choice and The Gladstone keeps it simple with two poached eggs and grilled peameal bacon on a toasted English muffin topped with hollandaise sauce. The kitchen is all about local sustainable food and feature products from Toronto favourites like Ying Yang Soy Foods and Tealish tea blends. The coffees are fair trade and served with organic milk. All the take-out containers, napkins and bags are biodegradable and the hotel also makes a point to use non-toxic and biodegradable cleaners. 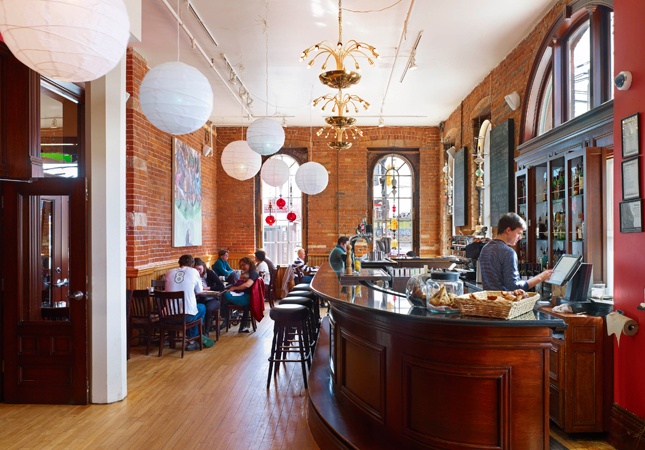 The Gladstone Cafe is a hip + urban win for Toronto and I love living so close to this gem. 2) Comment in the Gladstone Brunch Contest string and tell us, what's your favourite thing to eat at Sunday brunch? We pick a winner at random on Monday - good luck! I've only had drinks there.